Mike Bertoia, Goway Islands Product Manager recently returned from the Islands of Tahiti. Sponsored by Tahiti Tourisme and Air Tahiti Nui. Mike had the opportunity to visit a variety of resorts throughout the islands, allowing him to share with you his experiences, tips and reasons why you should recommend the Islands of Tahiti to your clients. Where did you go in Tahiti? I was fortunate to explore some areas of Tahiti I had not yet been to in my previous trips to the Islands of Tahiti. 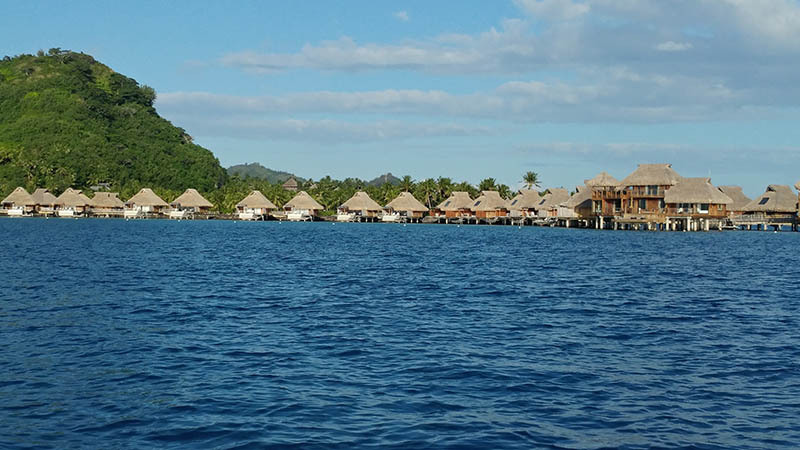 I had the opportunity to visit some of the Society Islands like Tahiti Iti, Huahine, Tetiaroa, and Bora Bora. 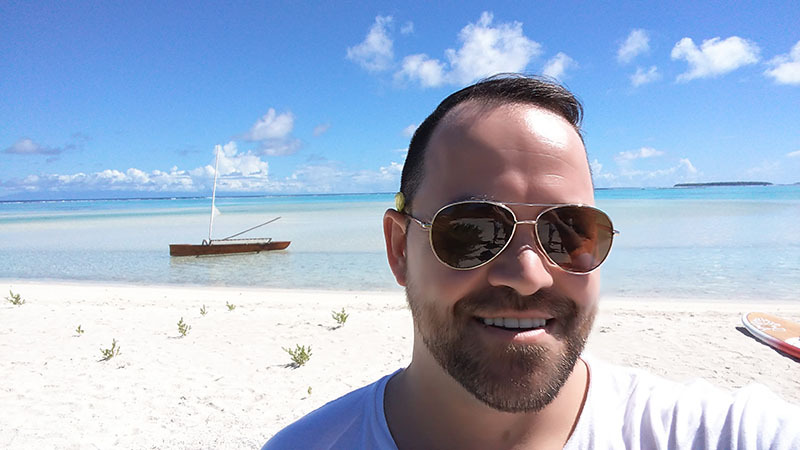 I also enjoyed my first time out to the islands of Tuamotu and Rangiroa. Describe some of the properties you visited? The Brando Tetiaroa: The Brando is an eco-lux all-inclusive resort consisting of 12 motus (private islands) that surround a spectacular lagoon. Access to The Brando is by a 20-minute private plane flight from Tahiti. This all-inclusive resort features 35 secluded villas with private pools on beautiful white sand beaches. Since it’s so secluded, it’s frequented by sea turtles and exotic birds with an abundance of activities to enjoy including snorkelling, diving, sailing, and paddle boarding to a neighboring island. On land, you can explore or spend your time relaxing on the beach. Maitai Lapita Village Huahine: The Maitai Lapita Village Huahine lies between a lake and the lagoon, on an ancient archaeological site. Surrounded by the richness of this lush tropical island, its history and cultural heritage, stunning scenery, beaches and marine life are second to none. 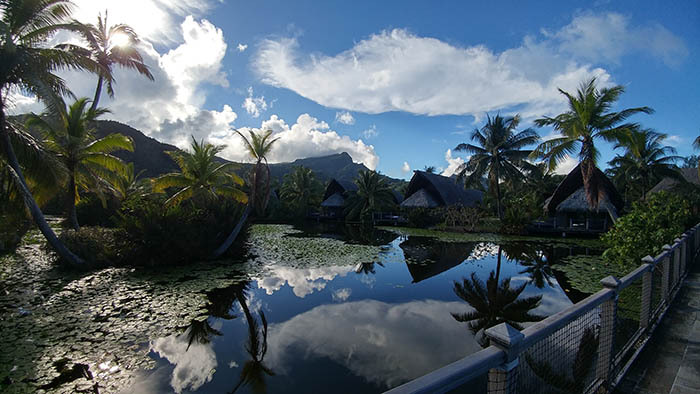 The Maitai Lapita Village Huahine is a dream destination for all divers, explorers, sea lovers, and those who treasure vacations filled with discoveries that stir the emotions. Your accommodation is traditional, immersed in the wilderness of the island, yet affordable, making it the ideal place to stay while you discover the Islands of Tahiti. Le Meridien Bora Bora: Fresh from a recent renovation, this luxury hotel is nestled on a magnificent islet surrounded by crystal clear turquoise waters with a private lagoon, setting the stage for an unforgettable tropical getaway. Le Meridien Bora Bora is located on the southern point of Motu Piti Aau, a 10-kilometer-long islet on a coral reef. With some of the best views of world-renowned Mt. Otemanu. Unique to Le Meridien is the ability to immerse yourself in island wildlife at the Bora Bora Turtle Center, located on property. Le Meridien is also the only property on this list to offer an option to upgrade to an all-inclusive package. Intercontinental Bora Bora Resort & Thalasso Spa: The unique 5-star eco-friendly InterContinental Bora Bora Resort & Thalasso Spa is ideally located facing the main island of Bora Bora and the majestic Mt. Otemanu, offering guests staying at this award winning resort spectacular views, overwater villas, lush tropical vegetation, and a wide range of activities to keep busy. The property recently opened five new Pool Overwater Villas and five Pool Premium Overwater Villas in July 2017, along with four Prestige 1 & 2-Bedroom Overwater Brando Pool Suites in December 2017. It all adds up to create the perfect companion for sister property, the Brando. Conrad Bora Bora Nui: Conrad offers an idyllic and luxurious retreat located on a private motu (island) with a powdery white sand beach. Conrad opened in March 2017 and is Bora Bora’s newest resort. It offers a variety of luxury accommodations including overwater villas with plunge pools, as well as the destination’s only two-story, two-bedroom overwater bungalows (Presidential Overwater Villas). Guests also have access to Motu Tapu, a private island ideal for intimate events, weddings, or romantic dinners. Kia Ora Resort and Spa Rangiroa: Located between two spectacular passes in the Northwest coast of Rangiroa, Kia Ora Resort & Spa is an exceptional place to stay while on holiday. Nestled on a white sand beach and shaded by swaying palm trees, there is something for everyone to do on this island. 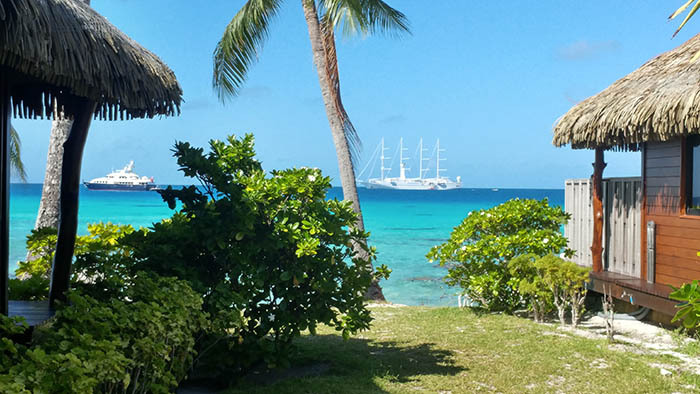 Rangiroa is also the perfect location for clients looking to dive or snorkel. What excursions or activities did you do? Circle Island Tour Tahiti: What a great day this was seeing everything the main island Tahiti and its smaller sister island Tahiti Iti have to offer, from hidden waterfalls, Teahupo’o known for its surf locations, and the Arahoho blow hole just to name a few. Along the way you will have the opportunity to visit roadside markets where the Tahitians sell fish, fruit, nuts, and crafts. Shark and Ray: On this tour we had the opportunity to get in the water and get acquainted with black tip sharks, sting rays (puppies of the sea), and other tropical fishes of Bora Bora. On your way back, the last stop will take you snorkeling within another magical coral garden. Do you have any selling tips for agents? Sometimes agents only think of Tahiti for their high-end, luxury travelers. Don’t overlook the Islands of Tahiti for your clients looking to stay on a budget. There are some beautiful and affordable properties here, with that being said, Tahiti truly has something for everyone and all budgets. With over 118 islands in Tahiti there are tons of experiences to choose from. Mike Bertoia is Goway’s Islands Product Manager. For any questions on his Fiji trip, feel free to contact him at [email protected], and stay tuned for his follow up article all about the guest houses and lodges of the Islands of Tahiti. Contact one of our Idyllic Islands experts for a tailor-made itinerary or destination advice.